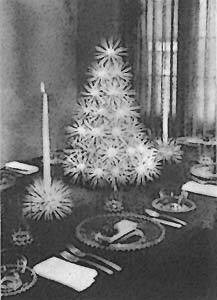 For the first time in my LIFE, I will be celebrating Christmas without my family (parents / brother). 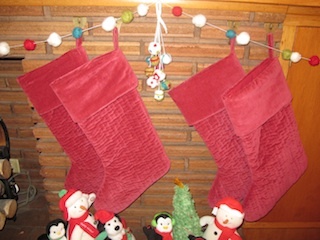 This will also be our very first Christmas in the Prairie House. I'm excited but sure I'll be curled up crying under the christmas tree on Christmas eve. First order of business for the Prairie Christmas is decorations. We pulled them out from the crawl space last weekend and realized that after several moves into parents' basements (while I was in grad school), a couple downtown apartments and a townhouse, we have accumulated a substantially crappy collection of Christmas decorations - consisting mainly of tinsel garland and old candy canes. 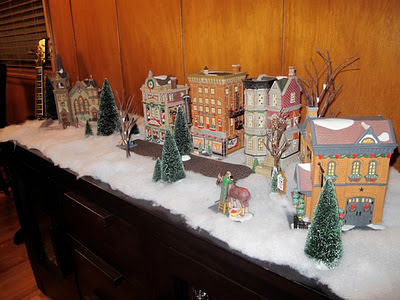 And since hubby blew this year's Christmas decorating budget on his Christmas village ... Popcorn garland anyone? 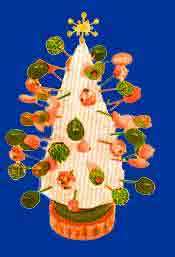 A festive pimento olive and ham tree. Yummy. Uhhhhh - glitter, toothpicks and Styrofoam balls? I think I'm safe with the popcorn garland. Voila! 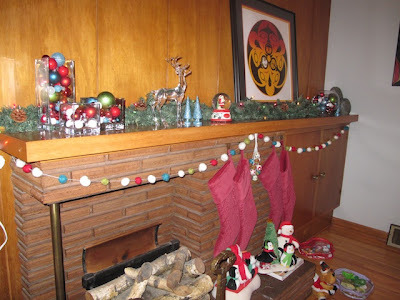 The mantle all dolled out for MCM Christmas. 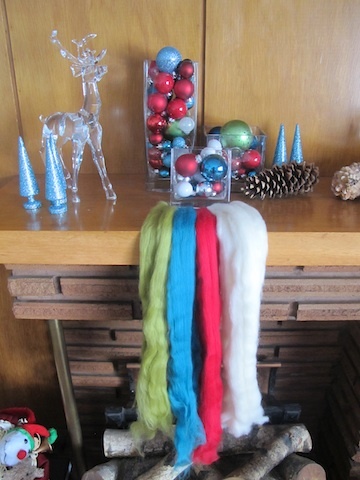 The garland is felt balls that I made from Merino wool roving. I found mine at Shuttleworks, south of Calgary in De Winton. A bag chocked full of 32 colours was about $40. 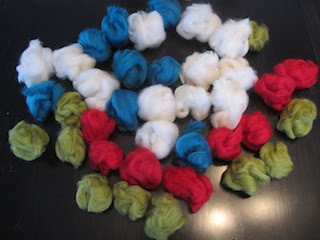 I used a felting needle (also from Shuttleworks - 5 for $7) to decorate the balls. 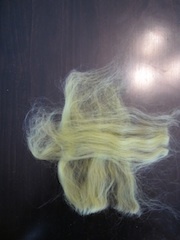 The colour selection of wool roving. 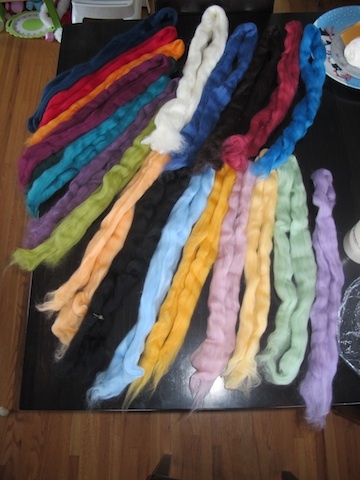 I cut the selected colours every 8", then split the roving into 4 sections. I spread out each section and laid them perpendicular, then rolled them up in a ball. I made about 52 balls total. 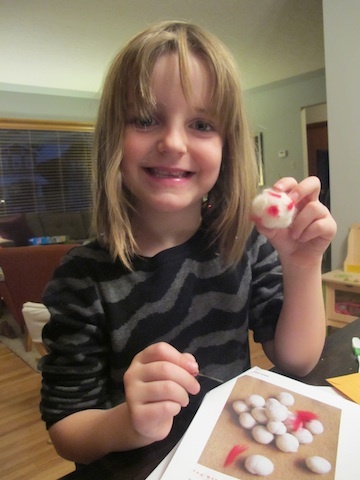 Then Lily and I used a felting needle to make patterns on each ball. Isn't she cute and crafty? 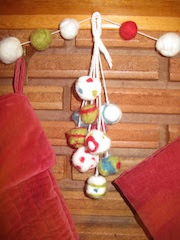 I used the felting needle to attach wool to each ball to make it into this decorative spray. 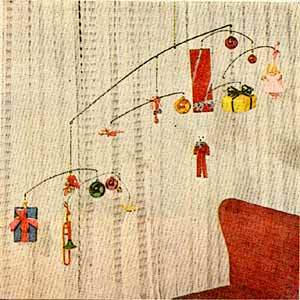 Then I strung each ball onto wool using a large needle to make the garland. 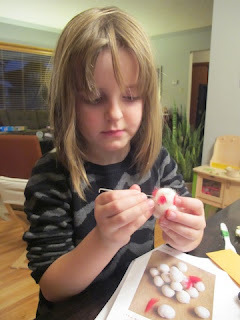 More detailed instructions can be found here on Purl Bee. I just discovered this website last weekend. 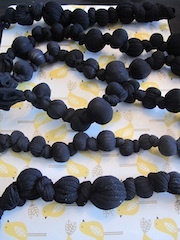 It makes me want to quit my job and buy a loom. 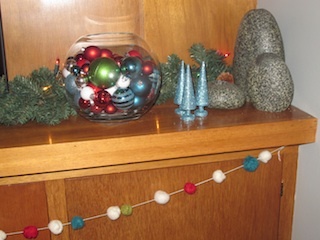 The rest of the mantle decor I scored at 30% off at Superstore. So pretty! And I love that glass reindeer. 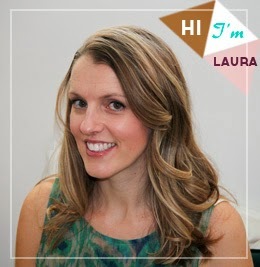 Thanks H! Oh, yeah. Definitely a 'glass' reindeer. 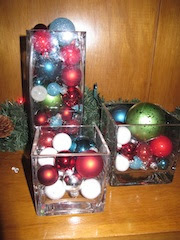 I love the balls in the vases! so did you not put up a tree? C - we had a fake tree, both secretly hated it, broke down and bought a real one on Monday.